FLOWERY BRANCH, Ga. (AP) — Tired of pompous, entitled athletes who don’t seem to realize how good they have it? He’ll give you a reason to cheer. Allen plays for the Atlanta Falcons, a 26-year-old free safety who will readily admit he’s not the fastest, not the strongest, not the biggest guy in the room. “I won’t be anybody’s first pick,” said Allen, who at 5-foot-9 comes up 3 inches shy of this aging sports scribe. This is a guy who hasn’t forgotten what it’s like to be told you’re not good enough — on HBO’s “Hard Knocks” no less, for the whole world to see. This is a guy who remembers what it’s like to spend a year on the practice squad, putting in as much work as the next guy but knowing he won’t get a chance to shine on Sundays. So, when word came that Allen had agreed to a contract extension with the Falcons, one that should set him up nicely for the rest of his life if he manages his money right, he didn’t exactly celebrate. Instead, he watched that “Hard Knocks” episode all over again, the one where then-Atlanta coach Mike Smith doles out the pink slip . Allen’s new contract — $19.5 million for three more seasons — pales in comparison to, say, teammate Matt Ryan, who agreed to a massive deal that averages $30 million a year and guarantees the star quarterback at least $100 million. But Allen is grateful for his $5.5 million signing bonus. He knows that’s a massive amount of money to just about anyone else. He hopes it sends just the right message to anyone scuffling on the fringes of a roster. Even now, he has a soft spot for all those guys going through the same struggles. 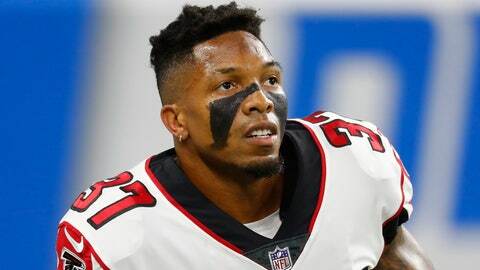 After Dan Quinn took over as Atlanta’s coach in 2015, he was impressed by Allen’s tackling skills but felt he was out of place at cornerback, his position at Purdue and what he started out playing with the Falcons. Allen was moved to safety. Suddenly, he blossomed. One training camp after being waived, he surged to the top row of the depth chart, going on start 14 games as a de facto rookie in 2015. But he never got comfortable. Not even now, when he’s so clearly a part of Atlanta’s long-term plans. “That ain’t in my blood,” Allen said, chuckling at the mere suggestion. Zealously guarding against those thoughts ever creeping into his head, Allen is always looking for ways to make things harder on himself. If his eggs are too runny, he’s not sending them back. If it gets cold in his room, he’ll turn down the thermostat even more. Allen has always worn his emotions on his sleeve, which was never more evident that when I talked with him less than an hour after the Falcons squandered a 25-point lead in the Super Bowl. While most everyone else did their best to cover up the overwhelming pain, Allen made it clear exactly how he was feeling. But, like every setback in Allen’s life, pain served a purpose. He put together another strong season in 2017, though the Falcons were knocked out of the playoffs in the divisional round. He’s one of the leaders on a young, speedy defense, doling out and advice and mentoring anyone who wants to know how to do things the right way. When the Falcons announced Allen’s new contract, there wasn’t a hint of jealousy from his teammates. Everyone rose from their seats, from the biggest stars on the team to those who will likely be cut in a week or two. “You see the impact that a guy like him has on a team,” Quinn marveled. It doesn’t matter if you’re a Falcons fan. No. 37 is a guy we can all root for.